Page Street Publishing, 9781624143830, 192pp. Improve your skin the way nature intended—with real, fresh ingredients! Nutritional Therapist Nadia Neumann completely transformed her skin by making simple switches to a nourishing, real food diet and natural skincare routine. 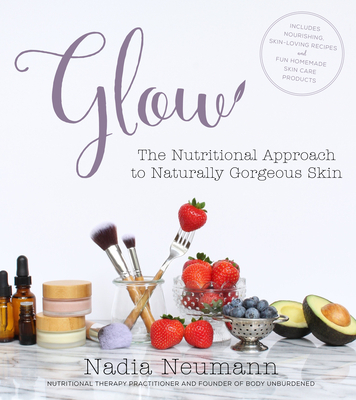 In Glow, Nadia walks you through the steps to naturally clear, radiant skin from the inside out. Learn the ways that issues inside your body—like inflammation you may not even notice—manifest themselves on your skin as acne, dryness or eczema. On the flip side, get the deets on how common skincare products and routines—like washing your face with harsh cleansers twice a day—can actually make these skin troubles worse. It’s science, but Nadia’s fun and friendly writing makes these issues easy to understand and fix for good. She’ll even spark your creativity in the kitchen with fabulous recipes like glow-getting smoothies, easy lunches and skin-nourishing dinners. Not to mention plenty of fun and unique DIY skincare products like masks, toners, eye creams and face oil blends. Packed with Nadia’s stunning photography, no other book will both inform and inspire you like this. Everybody—both young and old—has naturally gorgeous skin just waiting to be revealed; with this book, you will finally get your glow for life. Nadia Neumann is a Nutritional Therapy Practitioner and the founder of the popular health and wellness website Body Unburdened. She has appeared on The Dr. Oz Show, and she's been featured in numerous news and media outlets. She lives in San Jose, California.